If you are from North India, well the chances are very slim that you haven't tasted the famous Rajma, i.e the Red Kidney beans cooked in a wonderful spicy curry. 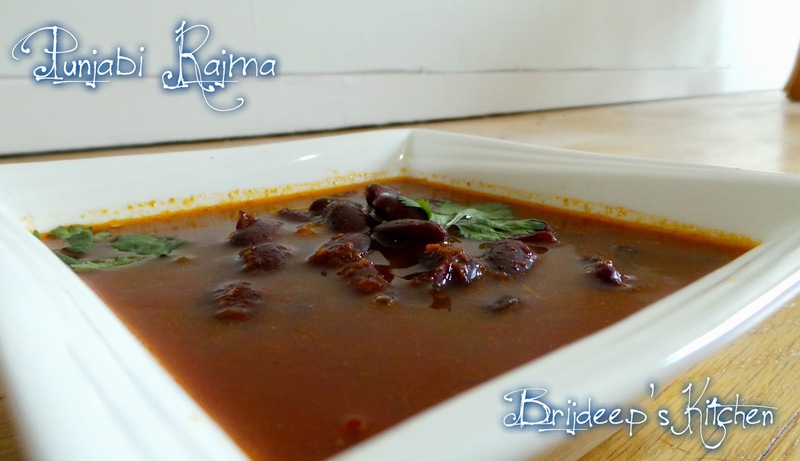 I've known my friends even from East and South seemed to have enjoyed Rajma. 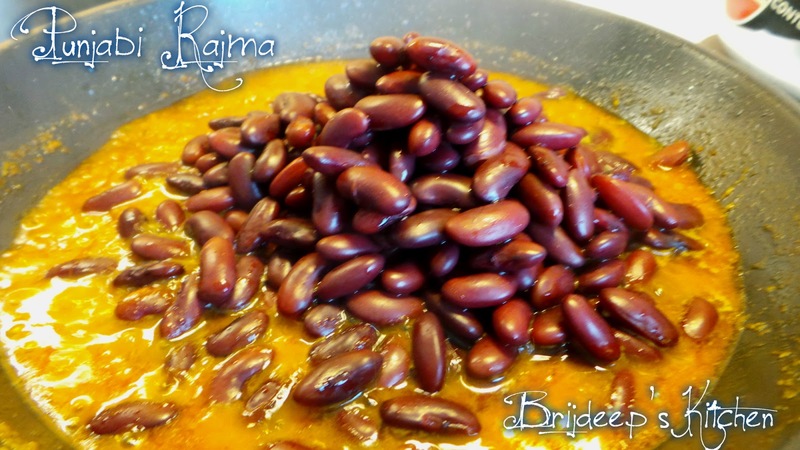 But eating rajma with anything but Jeera Rice or any other boiled rice would probably be listed as a crime; because the dish isn't just named "Rajma", but is named "Rajma - Chawal".. so rice necessarily have to be with it. Either it is rajma-chawal, or it is no rajma. Period. Now, being from a typical Sikh family, it would have been a sin to enjoy rajma-chawal and not knowing how to make it.. 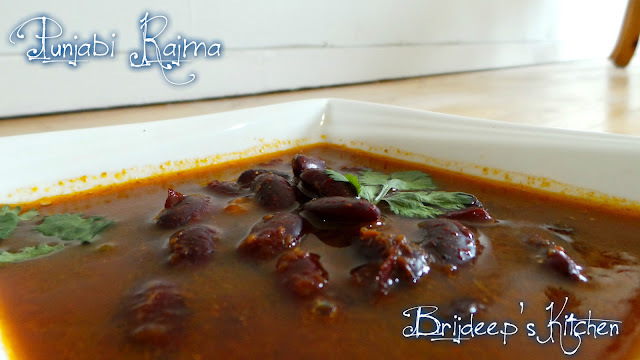 So for so many years, I followed my mom's recipe and I used to create the exact replica of mom's hand-made rajma.. quite an achievement, eh? And in lieu of my arranged wedding, I was asked if I know how to prepare rajma-chawal.. and I was absolutely confident about that to impress them. 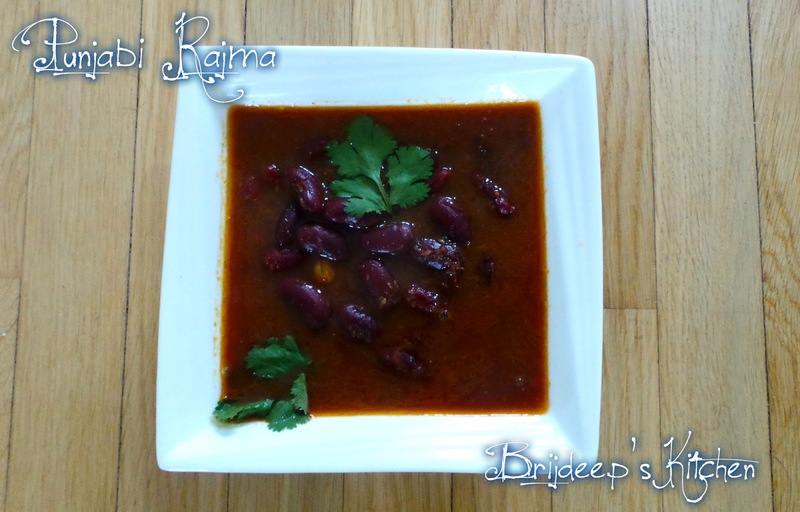 So here's my mother's perfect Rajma recipe and a step by step description of how to prepare it. 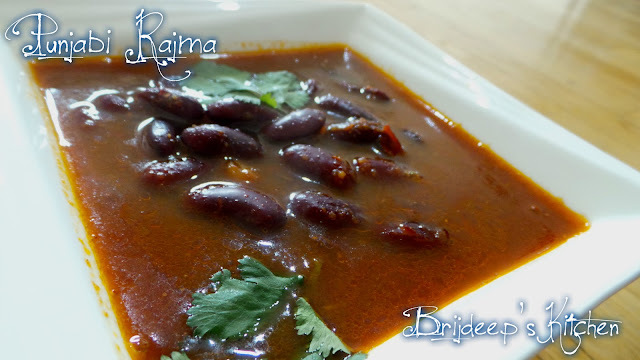 Soak the rajma in a big bowl of water for overnight (7-8 hours). 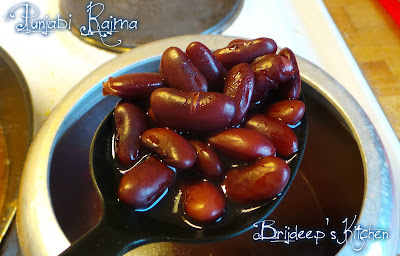 The size of rajma will be 1.5 times after they are being soaked. Drain the water and wash them thoroughly. Put in a pressure cooker with 6-7 cups of water and boil it for 6-7 whistles (depending upon the cooker). Let the steam release from the cooker, open it carefully (because of the hot steam) and take out 2-3 beans with the help of a spoon and check them if they are done by eating one or two. If they are not yet done, get 1-2 more whistles. Keep them aside. 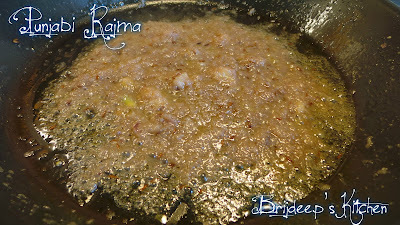 Add the chopped onions and garlic in a grinder, add little water and grind it to a smooth paste. Take out the mixture in a bowl and keep aside. Now put chopped tomatoes, green chilli and ginger in the mixer and grind them together. Take out the mixture in another bowl. Keep aside. Now we begin to prepare the curry for the rajma. 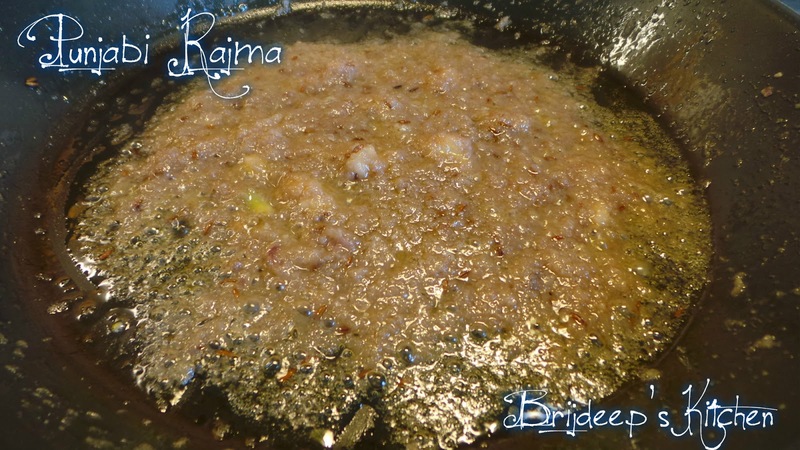 In a shallow cooking pan, heat the oil on medium flame and add cumin seeds and asafoetida. When the cumin splutters, add the onion-garlic paste to the pan. Begin to mix it and cook it and it will start getting fried. 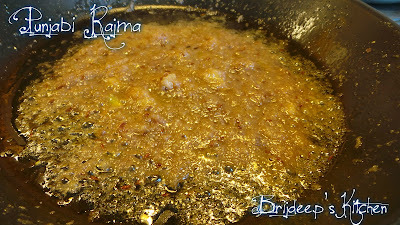 Keep stirring so the masala does not get stuck to the base of the pan. 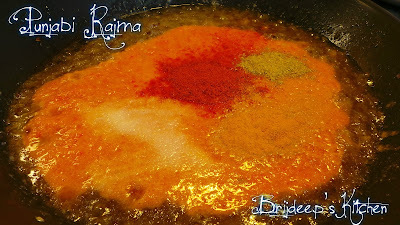 Keep stirring till you see the masala is getting cooked and turning a shade of brown and begins to leave oil on the sides. This step is very important so don't skip this step otherwise the whole curry would be bitter because of raw taste of onions. 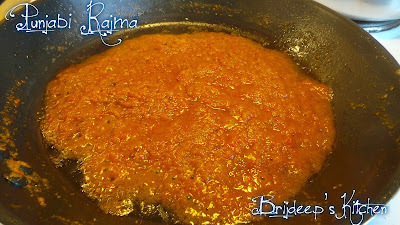 Now, add the tomato paste onto the pan and mix well. Add salt, turmeric powder and red chilli powder. Mix well and let the masala cook on medium flame while keep stirring regularly. 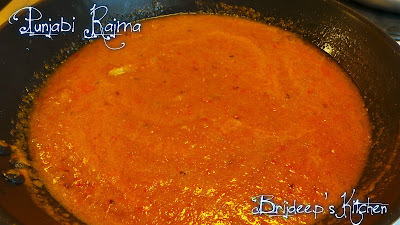 The tomato masala will be cooked completely and will start to leave oil on the sides. At this stage the masala is done. 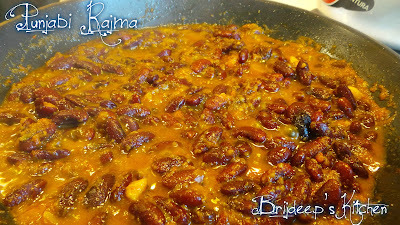 Now add the rajma from the cooker to the pan (without the water). Do not throw away the water, just let it be in the cooker because the whole mix will be transferred to the cooker and the water will be use to cook the curry. 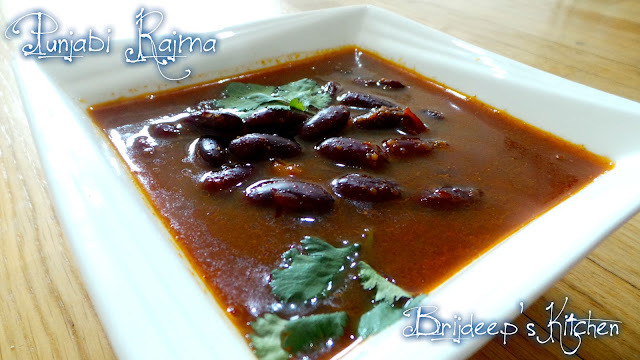 Mix the rajma well in the masala and begin to stir in the masala on medium flame. Fry them in the masala for about 5-7 minutes. If you skip this step, the masala won't be fully absorbed in the rajma. 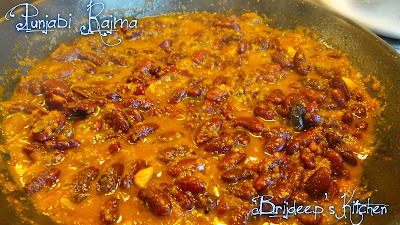 Now the rajma is done. Turn off the flame and add all the contents of the pan to the cooker and let it cook on low flame for about 20 minutes. Do not add any more water as it will dilute the masala consistency. 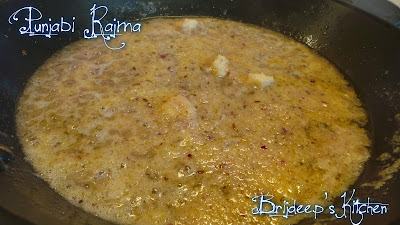 Add enough water in the beginning while boiling rajma. Turn off the flame and sprinkle garam masala. Keep the lid over the cooker (do not close) and let sit for another 10 minutes. Remove cover, garnish with coriander and serve piping hot with nothing else than jeera rice and enjoy like a glutton until you can't move !! Love my recipes? Make sure to join my Facebook Page and Pinterest for regular recipe updates. Looking for more Punjabi recipes? Try this Dal Makhani recipe, Dal Bukhara recipe, Paneer Makhani, Pindi Chhole recipe and Punjabi kadhi with pakoda recipe. Hi, loved your recipe, going to try soon. Quick question, did u add corriander powder too along with salt, turmeric, red chilli powder? I felt i saw that in pic. 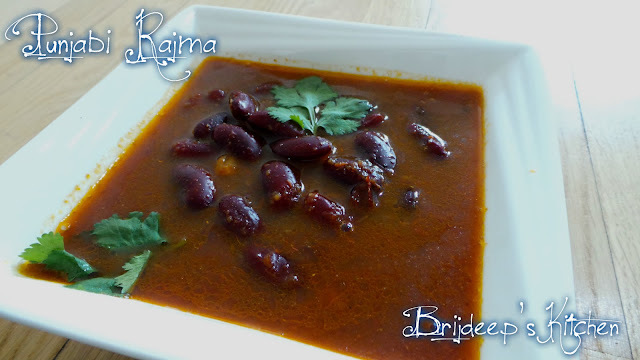 Will give you feedback once I make this rajma recipe. Punjabi Rajma Masala is one of the favoratie dish of Mine. I love to eat with Naan Roti. Thanks Brijdeep Kaur for sharing your great and awesome Recipe with us.